The Villa Reale in Monza was built between 1777-1780 by Piermarini for the son of Empress Maria Teresa - Archduke Ferdinand - as his summer home and hunting lodge. Over the centuries the Villa has changed hands many times and at one point was home to the Italian monarchs Umberto I, his son Vittorio Emanuele II and his wife Margherita di Savoia (the first Queen of Italy). After years of being closed to the public, Villa Reale has undergone extensive restoration work for EXPO 2015 and has been returned to some of its former glory. This wonderful palace complex includes the Cappella Reale (Royal Chapel), the Cavallerizza (Royal Stables), the Rotonda dell'Appiani, the Teatrino di Corte ("Small Court Theatre") and the Orangerie. Visitors can now visit the rooms in the main body of the Villa which include the grand salons and halls, as well as the Royal apartments of King Umberto I of Italy and Queen Margherita of Savoy and Belvedere. Unfortunately much of the original furniture is currently in the Quirinale in Rome, however, pieces are slowly being restored and returned to this former Royal residence. 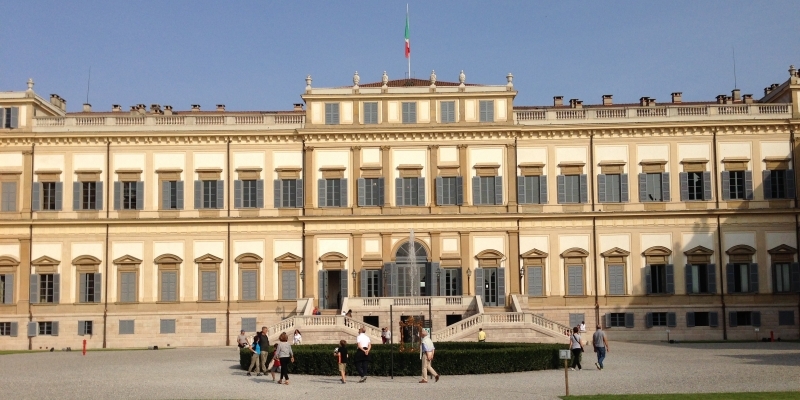 If you wish to visit the Villa Reale groups will need to book a guided tour in advance and we suggest that other visitors do so too to avoid the queues. To book please phone the call centre on 199151140 (Monday to Fridays from 9am to 6pm or Saturdays from 9am to 12pm) or go to www.villarealedimonza.it. or www.ticketone.it. If you book tickets in advance you will need to pay a pre-booking fee, otherwise tickets cost: Euro 12 for adults, Euro 10 for OAPs and Euro 4 for under 18s. Guided tours can be organised for groups (minimum 15 people) in different languages for Euro 120. After you have visited the Villa Reale why not go to the bar on the ground floor for a drink or something to eat. You won't be disappointed.